Reagent exhibits at least 94% transfection efficiency of siRNA delivery. Transfection efficiency was determined by qRT-PCR. Although lung cancer therapeutics have evolved dramatically within last two decades, lung cancer is considered the primary cause of cancer deaths globally in both men and women. Non-small-cell lung cancers comprise approximately 80% of all lung cancer incidences and include adenocarcinomas, squamous cell carcinomas as well as large cell carcinomas. Non-small cell lung cancer is frequently diagnosed at advanced stages, with the average 5-year survival rate of only 16%. New approaches in lung cancer therapy are crucial in treating advanced-stage patients. The NCI-H1975 epithelial cell line was isolated in 1988 from lung cells taken from a non-smoker female with adenocarcinoma. NCI-H1975 is useful in investigative and analytical studies of new lung cancer drugs. 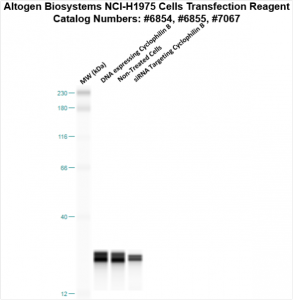 Altogen Biosystems provides high-efficiency transfection reagent kits for the NCI-H1975 cell line. Figure 1. Cyclophilin B silencing efficiency was determined by qRT-PCR in the NCI-H1975 cells transfected by Cyclophilin B siRNA or non-silencing siRNA control following the recommended transfection protocol. Cyclophilin mRNA expression levels were measured 48 hours post-transfection. 18S rRNA levels were used to normalize the Cyclophilin B data. Values are normalized to untreated sample. Data are presented as means ± SD (n=6). Figure 2. Protein expression of Cyclophilin B in NCI-H1975 cells. DNA plasmid expressing Cyclophilin B or siRNA targeting Cyclophilin B were transfected into NCI-H1975 cells following Altogen Biosystems transfection protocol. At 72 hours post-transfection the cells were analyzed by Western Blot for protein expression levels (normalized by total protein, 10 µg of total protein loaded per each well). Untreated cells used as a negative control.